Nago mayor Susumu Inamine visited the United States Department of State to convey opposition to the Henoko relocation on May 19 in Washington D.C.
May 21, 2014 Ryota Shimabukuro of Ryukyu Shimpo reports from Washington D.C.
Nago Mayor Susumu Inamine met Peter Hemsch, the deputy director of the Office of Japanese Affairs at the U.S. State Department on May 19. The mayor conveyed his intention to oppose the plan to relocate U.S. Marine Corp Air Station Futenma to Henoko, Nago. But Hemsch said the US would move forward with this plan because both the national governments had already decided. He added that the governments had created a road map and reached the current plan over a long period of consultation. Patrick M. Cronin, a senior advisor at the Center for a New American Security, said he would support the Henoko relocation because of the Okinawan governor’s approval of the landfill. He said it provided important deterrence in the territorial issue between Japan and China. Cronin had questioned the Henoko relocation in papers he published. After the meeting with the mayor, Cronin told reporters why he had changed his position the Henoko relocation. He said though he would like to respect the opinion of the re-elected mayor, he stressed that the Okinawan governor had made a decision on the plan, and that the US and Japanese governments had already consulted with the people of Okinawa for many years. Inamine met former Senator Jim Webb, who led the review of the Henoko relocation in the U.S. Senate Armed Services Committee, 2012. 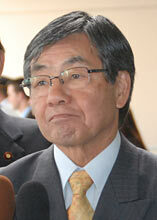 The former senator says it is difficult to carry out the Henoko relocation. He said that he could not engage in direct lobbying, because he retired from his job as a senator. However, he said he would like to help the mayor as an individual. The mayor also delivered a lecture at the Cato Institute, the libertarian think tank, which advocates a conservative viewpoint on a number of issues. Doug Bandow, a senior fellow at the institute and the facilitator of the lecture by the mayor, suggested a solution to the Futenma issue;　bring back the Marine Corps to the United States. He said that the United States could not afford　to continue to　station military overseas for the next 10 or 20 years, due to economic and budgeting problems.